Automotive brand MINI USA has partnered with creative agency Pereira O’Dell to craft a new campaign – and cultural moment – in tandem with the new MINI Countryman. The spot, “Don’t Fence Me In,” follows musician Labrinth as he drives a MINI Countryman. Alone with his thoughts, the Countryman provides an oasis that sparks an inspired moment in the form of the song “Don't Fence Me In." Thanks to the headspace and interior space of the MINI Countryman. Labrinth’s rendition of the American classic reflects his desire to roam, create, and explore freely – one that the Countryman enables. As he sings, the streets remain empty, symbolizing the space the vehicle offers its drivers. When Labrinth exits the vehicle, his moment of tranquility has ended and the city returns to its normal, hustle and bustle. Yet, his moment of inspiration continues as he enters a recording studio to sing the song from his drive. “Don’t Fence Me In” will become available as a full-length, studio-recorded song for MINI-drivers and more to listen to when they seek inspiration on the road. MINI and Pereira O’Dell gave Labrinth full creative control over its creation, so as not to “fence him in,” so to speak. Promotional premiums related to the song are also being pursued (i.e. vinyl record) to be employed at local dealerships and beyond. In addition to the song, the campaign includes behind-the-scenes social and video, print, digital, and social. 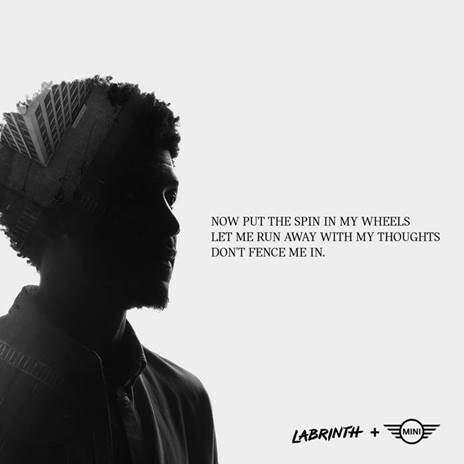 Both MINI and Labrinth, both British-based, aim to heighten recognition among North American audiences through this campaign.